1. Pallas trine Pluto: ethics compromised by power. 2. Venus semisquare Neptune: property rights liquefied. Property includes one's own body. 3. Venus conjunct Pluto: the destruction of property. 4. Pluto quincunx Moon: death of (human) family. 5. Pluto septile Saturn (ruler of Sun and Venus): destruction infuses the day. 6. (optional) Mercury conjunct Sun. 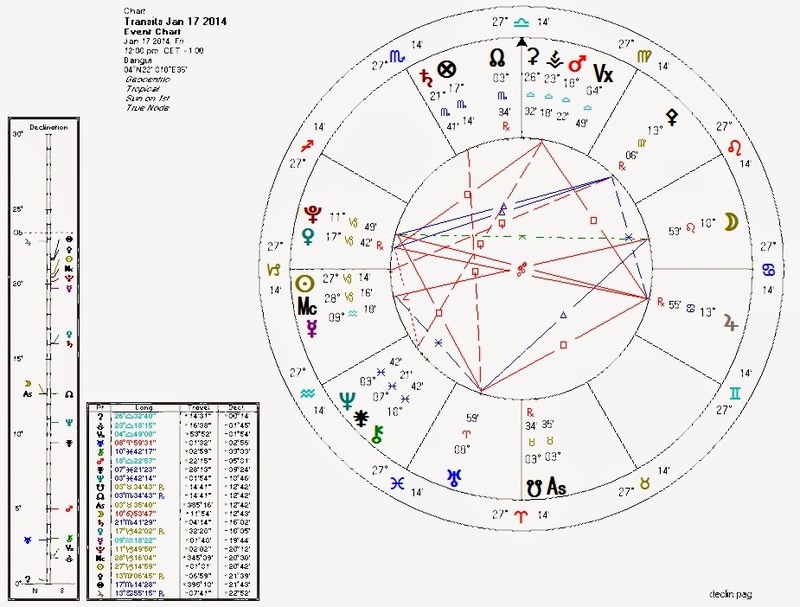 The Pluto-Sun connection is relatively weak and probably accounts for why we didn't see much more violence. On the most recent Capricorn Ingress chart (of the Sun), Mars, Pluto, and Uranus are all angular for the Central African Republic. I don't see a similar pattern for recently-bombed Sochi, however.